Pityriasis alba (PA) is an eczematous dermatosis characterized by patchy hypopigmentation. It is usually seen in children, and is most noticeable in those with darkly pigmented skin, although it may occur in all skin types. The history will usually reveal worsening during the summer, as the contrast between normal and lesional skin becomes greater with sun exposure. Lesions are usually asymptomatic, although they can be slightly pruritic. Physical examination reveals multiple, 0.5-5–cm, ill-defined, finely scaling patches that are symmetrically distributed. Lesions are most commonly found on the face (especially the cheeks), but can also be seen on the trunk, upper extremities, or rarely other locations (Figure 1). They may be slightly erythematous early on, then become hypopigmented. Lesions may persist for months to years, with a chronic relapsing course, but eventually resolve spontaneously. Pityriasis alba on the cheek. Extensive pityriasis alba (EPA) is a variant that is more common in adults and has a more generalized and truncal distribution. The individual hypopigmented patches in EPA are identical to those of classic PA, except that they are usually not preceded by erythema and tend to be more persistent. EPA may be clinically indistinguishable from progressive macular hypomelanosis (PMH), which is possibly caused by Propionibacterium acnes. These conditions may be differentiated by Wood’s lamp examination, which reveals red fluorescence of lesional skin in PMH. The differential diagnosis is fairly broad, and includes vitiligo, tinea versicolor, pityriasis lichenoides chronica, sarcoidosis, and mycosis fungoides. Woods lamp examination can help distinguish PA from depigmented patches of vitiligo, and potassium hydroxide (KOH) preparation would show spores and hyphae in tinea versicolor. A punch biopsy may be useful in excluding the other entities in the differential. 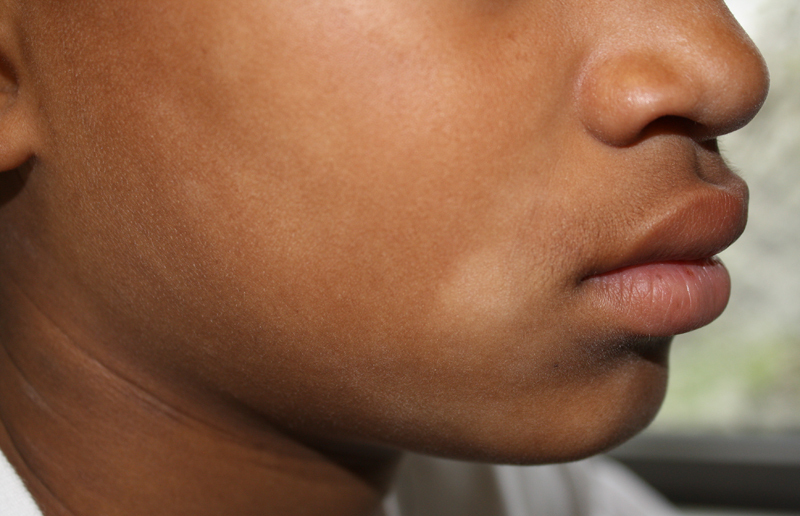 Pityriasis alba primarily affects children from 3 to 12 years old, and almost all patients are younger than 16. It is strongly associated with atopy, with a prevalence in the general population of 1%, but up to 32% in atopic individuals. Xerosis also appears to be a risk factor, and frequent bathing and hot water temperatures may exacerbate this. There is also a higher incidence in children with poorer socioeconomic backgrounds. Other proposed contributing factors include environmental factors such as temperature variations, air humidity, altitude, and excessive sun exposure. Both genders appear to be equally affected in classic PA, although some studies have shown a male preponderance. In contrast, EPA preferentially affects females. While the hypopigmentation seen in pityriasis alba is usually categorized as postinflammatory, the actual pathogenesis is unclear. The number of melanocytes is reduced, as is the number of melanosomes within both melanocytes and keratinocytes. There is normal melanin synthesis and melanosome transfer. The most significant association of PA is with an atopic diathesis. A detailed personal and family history should be obtained, including questions about asthma, allergic rhinitis, and atopic dermatitis. Although PA does not have any systemic implications, it is essential to rule out other entities in the differential diagnosis that do, such as sarcoidosis and mycosis fungoides. A biopsy may help in differentiating these conditions. PUVA, psoralens plus ultraviolet A.
Topical corticosteroids are usually considered to be first-line treatment for PA. Given that the most common location is on the face of children, only low-potency steroids, such as hydrocortisone 2.5% (cream, ointment or lotion twice daily) or desonide (0.05% cream, ointment or lotion twice daily) should be used in these cases. For patients with truncal involvement, higher-potency steroids may be considered. Immunomodulators such as tacrolimus (0.03% in children younger than 15 years or 0.1% in those older than 15 years, twice daily) or or pimecrolimus 1% cream have been reported to be effective, as has topical tretinoin, although this may be too irritating in some cases. Phototherapy with psoralens plus ultravolet A (PUVA) may be beneficial in extensive cases. Pityriasis alba usually has a chronic and relapsing course, with months to years before spontaneous resolution. Response to treatment is variable, and it can take weeks to months for noticeable improvement with any of the treatment modalities. The patient should make a follow-up appointment in 2-3 months to assess the efficacy of the treatment. If no improvement is noticed, consideration should be given to changing therapies. Maintenance therapy consists mainly of emollients and sunscreen. For atypical presentations, other entities that may cause hypopigmentation should be considered (see differential diagnosis above), with a special emphasis on ruling out either sarcoidosis or cutaneous T cell lymphoma (mycosis fungoides).